How Many Cigars Are Enough For My Baby Shower Guests? Why not add a new twist to the tradition of passing out cigars upon the birth of a child and provide cigars for a baby shower? Mild to medium bodied cigars are appealing favors for guests who attend a couple’s shower. Quality cigars can be presented attractively in jars or display boxes that are coordinated with the colors or theme of the event. When deciding how many shower cigars to order, keep in mind that sticks accented by cute decorations will probably attract attention. Anticipate that at least 50 percent of your guest list will probably want a cigar at the shower, though demand may be higher for specially decorated favors. Federal Cigar offers baby shower cigar packages that are ideal for these special occasions. Today, a baby shower can give both mothers and fathers an opportunity to receive heartfelt gifts. We provide cigars for hosts and hostesses to share with their shower guests. We also have cigar boxes to be given as a gift to parents. Recipients can then pass out these cigars whenever their blessed bundle arrives. 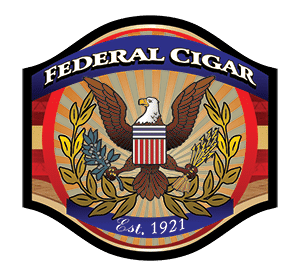 Appealing boxes and tins from Federal Cigar will hold carefully crafted and hand rolled products, which have been stored in the ideal environments for optimal freshness. Temperature and humidity control unit with fast shipping to ensure your cigars have amazing flavors and bouquets. Do You Need Guidance in Choosing Cigars? Federal Cigar can help you enhance your traditional celebration. Our cigar knowledge and friendly guidance allow you to have baby shower cigar favors that add that special touch or conversation starter to the traditional shower. You may be searching for creative favors or a unique gift for expectant parents. Our tobacconists are here to assist you. We can recommend quality cigar choices, attractively packaged for that special person or celebration.